“There’s just no cash.” That’s the Coles Notes from a senior banker describing the book of oil service loans he manages for one of Alberta’s leading lenders. There’s simply not enough cash flow to support current levels of debt. Bankers and borrowers have kicked the can down the road about as far as they can as more oilfield service (OFS) and exploration and production (E&P) companies default on their loans and seek more relief on lending covenants. While a significant oil price increase to lift all the sinking boats will surely come, it won’t happen soon enough. More of the same won’t work. Oil industry debt is everyday news. But the discussion is about the symptoms, not the ailment. Companies cannot borrow their way out of debt. Equity capital is only available at distressed valuations. Specialized OFS assets will fetch only a fraction of replacement cost—if somebody actually wants them. Although oil and gas reserve valuations are down by half, borrowers are being forced to sell them anyway to repair balance sheets. The last four months of 2015 will be very difficult for any company with meaningful amounts of debt. Same for their lenders, the other signatories to the loan agreement. As the banker said, “There’s just no cash.” Here’s what it means. The foundation of global credit markets is based upon the borrower’s capability, obligation and commitment to pay the money back. The amount of money anybody can or should borrow is dependent upon free cash. Not forecast cash flow, not earnings before interest, taxes, depreciation, and amortization (EBITDA), not good intentions. Free cash. How much money is available to service debt after all the other bills are paid. This is the key factor behind every credit application, from a car loan or home mortgage to an operating line of credit or senior secured term debt. The more free cash you generate, the more you can borrow. When free cash drops, the opposite is true. But what happens when an entire industry can no longer service previous levels of debt? ARC Financial produces a weekly chart calculating revenue, spending and upstream cash flow for the entire Canadian E&P sector for the current and preceding 14 years. Selected data has been reproduced below. MNP added 1998, 1999 and 2000 from prior reports. ARC calculates total revenue from all oil and gas produced, then deducts direct lifting and operating costs, taxes and royalties and the administrative cost of running the business. The result is “after-tax cash flow,” which is the free cash available for exploration, development, dividends and, of course, debt servicing. 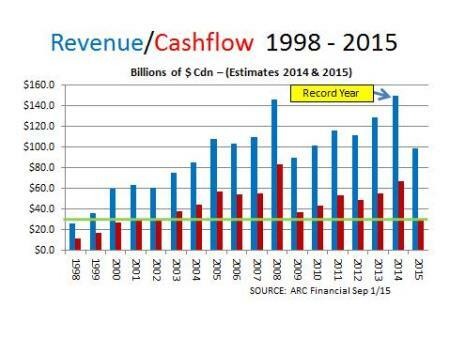 Gross revenue from production sales is in blue and after-tax cash flow in red. The green line is 2015’s estimated cash flow compared to prior years. The figures are not corrected for inflation. While the 2014 numbers aren’t finalized, ARC estimates total revenue was an all-time record $149.2 billion, generating after-tax cash flow of $67.1 billion, the second-highest in history. Combined with capital inflows from debt and equity and inter-company transfers, E&Ps invested $75 billion on conventional and oilsands capital expenditures (CAPEX, not shown). CAPEX in 2014 was also at an all-time record which created fabulous revenue and earnings for OFS. This year is brutal. ARC expects revenue to plunge 33.6 percent to $99 billion, the lowest number since 2009. Except for the recession, you have to go back to 2004 to find total revenue that low. But because today’s production mix is increasingly composed of high-cost oilsands, cash flow is expected to be only $28.9 billion, 43 percent of 2014’s levels. This is the lowest level of after-tax cash flow generated by producers since 2001. ARC’s estimated CAPEX this year is only $39.1 billion, 52 percent of last year’s levels. That’s why the active rig count is the lowest in years. If the whole industry only has 43 percent of 2014’s cash flow, then in theory it can only carry 43 percent of last year’s debt. Of course, debt is not evenly distributed but the point is clear; the industry’s macro balance sheet is under severe stress. When Canada’s Big Six banks reported their earnings for the third quarter ended July 31, 2015 it was noted these lenders had total exposure to the upstream oil and gas industry of about $44 billion. Including other sources of debt (bonds, other banks, equipment leasing companies), this figure is likely only a fraction of total obligations. It could easily be $60 billion, probably much more. With so many private operators complete figures are impossible to compile. At current oil prices, too many producers are not generating enough free cash for their debt levels. For oilsands, some bitumen is undoubtedly produced at a cash loss. Success at current prices is based entirely on geology. Some reservoirs are less price sensitive than others. Some E&Ps have less debt than others. Hedges on future production locked in last year at much higher prices cushioned the problem. As they expire, they cannot be replaced. When you see reports that some producers are cutting staff, slashing dividends and selling properties, that’s because they’ve hit the debt-to-free-cash wall. OFS is also in tough shape. E&Ps have demanded suppliers cut prices and vendors have complied. Free cash from operations is either nominal or non-existent. Some are in default, some are in special credit and some are insolvent. Service companies are also slashing or cancelling dividends. Like E&Ps, you pay your shareholders AFTER you have paid your banker. So, if too many outfits are seriously over-levered for current prices, now what? How this affects different companies is as diverse as the companies themselves. The quickest way to de-lever balance sheets is to sell things—either shares or assets—to raise cash. But to whom? At what price? What if this can’t be done? Lenders are also in this mess up to their nostrils. They’ve been hoping this problem would just go away, a strategy with significant merit considering the alternative. The first quarter of 2015 was mostly shock and awe as prices tumbled. Where’s the bottom? It came on March 17 when benchmark West Texas Intermediate (WTI) crude closed US$43.39. Or so everyone thought. The first quarter average price was US$48.54. Awful, but surely it couldn’t get worse. The second quarter looked promising as WTI recovered significantly, reaching US$61.36 on June 10. The average price in Q2 was US$57.85. There was optimism that the worst was over. Borrowers requesting covenant waivers and forbearance letters were, for the most part, accommodated. No need to panic. Rising oil prices saved the day in 2009. Perhaps this would happen again. But the summer of 2015 has been brutal and set the tone for the rest of the year. Oil started to slide in July, averaging only US$50.90, and fell further in August until WTI reached a new six year low of US$38.22 on August 24. It closed on Friday September 4 at US$45.77. Futures markets, which showed materially higher forward prices earlier this year, indicate few believe crude will recover soon. The October 2016 WTI price was only US$51.59 on September 4. October 17 was US$55.47. No hedging opportunities now. What will lenders do? When Canada’s Big Six banks reported results for the quarter ended July 31, 2015, they declared Gross Impaired Loans of $13.8 billion, about $1.8 billion more than the same period in 2014. They set aside more funds for bad oil and gas loans but also published explanations of how their oilpatch exposure was manageable. But things got much worse in August. This figure will surely rise for year-end reports prepared as of October 31, 2015. In the next few months, non-performing loans (offside of covenants) will be split into two categories: salvageable and hopeless. The former could live to fight another day. The latter may end up with new owners, new lenders or completely insolvent with assets auctioned to the highest bidder. Salvageable loans will be those where management has demonstrated its understanding of the seriousness of breaching covenants and will have done everything possible to work with the bank, keep the credit in place and preserve shareholders’ equity. This includes cutting costs, slashing or eliminating dividends and raising equity or selling assets to reduce debt and de-leverage. Key elements include lender relationship management, presentation of all relevant data, credible forecasts and respect for who is really driving the bus. Covenants will be amended and stretched. There will be a serious effort by lenders to keep these borrowers and loans solvent to maintain the debt as an asset on their own balance sheets. Hopeless loans will be dealt with increasingly expeditiously. These are companies with business models that no longer work or companies which are unable or unwilling to present the information lenders require to further amend credit terms that have already been amended. Impossible demands for cash will be made from asset sales or equity injections. When this can’t be done, the file will be moved to special credit. There, the lender will do whatever it must to recover as much cash as possible. Options include selling the debt or the assets at whatever price can be secured. Shareholders’ equity will be zero, current management will likely be replaced and companies may disappear. Back in the last half of the 1980s, things were equally awful. Then, at least one major bank converted its loan to a drilling contractor to equity, in the form of preferred shares, coined “distress prefs.” The covenants were as rigid as the debt, but it worked. Whether lenders and borrowers will become this creative this time is not yet known. The story goes the largest drilling contractor in Canada in the 1980s was the Royal Bank of Canada. It’s safe to say they don’t ever want to get back into this business. There are significant pools of capital – equity and debt – waiting patiently to exploit opportunities. Valuations and calling the bottom have been major obstacles. Lenders will take care of that. Owners and equity holders on the wrong side of their debt will no longer be in a position to dictate price or value. Deals will get done. There is great remorse on all sides. Companies are realizing when business was good they got greedy and tried to grow faster than cash flow permitted, and used debt instead of equity to lever shareholder returns. Lenders are realizing they loaned money to management teams which talked a good story but in the end didn’t have the business model or know-how to manage the company through a serious and prolonged slump. To remain competitive, the Canadian oilpatch must seriously de-lever. Everybody – lenders and borrowers – will be taking a haircut until total debt is in line with free cash. Many companies will become “second owner businesses” as new lenders or owners restructure and reduce debt until it reaches a level the market can support. It would be great to be wrong but oil prices will not solve this problem anytime soon.